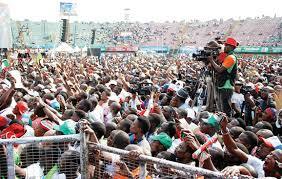 (News Investigators) /Pandemonium broke out on Monday in Abeokuta, Ogun State Monday as supporters of the Allied People’s Movement (APM) took over the presidential rally of the All Progressives Congress (APC). The campaign rally witnessed a slight security breach with security personnel making desperate moves to shield President Muhammadu Buhari and Vice President Yemi Osinbajo from the hostile crowds. Also in attendance were Governor of Ogun State, Ibikunle Amosun; APC National Leader, Bola Tinubu; APC National Chairman Adams Oshiomhole, among others. Trouble started when the Director General of the Buhari Campaign Organisation, Rotimi Amaechi told the people not to make any error during the forthcoming election and support the APC for all contested positions in the state. Mr. Amaechi’s, in a cynical but veiled reference to Mr. Amosun’s preference for another governorship candidate other than APC’s Dapo Abiodun, urged the crowd of supporters to vote for both Mr. Buhari and other APC candidates in the general elections. However, when Mr. Amosun, took the stage, he appealed to the party supporters to support Buhari’s reelection bid, but leave the matter of the governorship election till later. “When it’s March 2nd, we know what we’re going to do. The other one, on March 2nd, we will resolve it. This one is for President Muhammadu Buhari. Please I beg you in the name of God, please don’t be angry,” Mr. Amosun pleaded with the supporters. President Buhari in deference to the governor also urged partymen at the rally to vote for him in the next Saturday election, while they are free to exercise their right to choose their preference in other elections. However, as Adams Oshiomhole took to the stage to present the flag of the party to Mr. Dapo Abiodun, the APC governorship candidate, the crowd went wild and hurled various objects at the Oshiomhole and Abiodun. Mr. Osinbajo tried to pacify the crowd to initial success, but the crowd soon went so berserk that Oshiomhole, traditionally the longest speaker at APC rallies, spoke for less than a minute after being boed and shouted down for close to five minutes. After Mr. Amosun’s anointed candidate Adekunle Akinlade lost the APC governorship ticket in controversial circumstances to Mr. Dapo Abiodun, Amosun moved his structured to the APM. However, he continues to insist that his supporters will vote for President Muhammadu Buhari on February 16 before doing the same for the APM candidate on March 2. When the presidential campaign train of the APC hit Abeokuta, capital of Ogun State, Mr. Amosun publicly reminded his supporters to abide by the agreement.